and believes that each man should act in civil life according to his individual judgment and the dictates of his conscience. 32° Scottish Rite Masonry expands upon the fundamental principles of Freemasonry, exploring Masonic teachings more deeply. Building upon the ethical and philosophical teachings of the blue lodge, Scottish Rite reveals a wealth of knowledge about Masonry not found in the other degrees. It seeks to enrich the philosophy of the Symbolic Lodge in order to help good men become even better. consists of the first three degrees of Freemasonry: Entered Apprentice, Fellowcraft, and Master Mason. The Scottish Rite continues these degrees, from 4° to 32°. 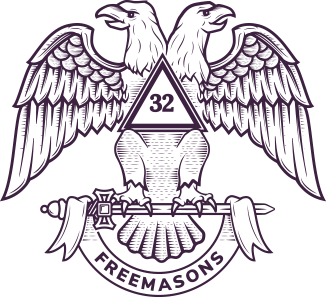 A Scottish Rite Freemason may attain the 33°, which is an honor bestowed for outstanding service to the Brotherhood.